Digital Photo Academy and LivinginHD present a free monthly series of photography webinars on LivinginHD.com. Your host, John Bentham answers many questions live during the webinars. Additional questions, answers and tips are posted here on digitalphotoacademy.com where you can also view the archived webinars. 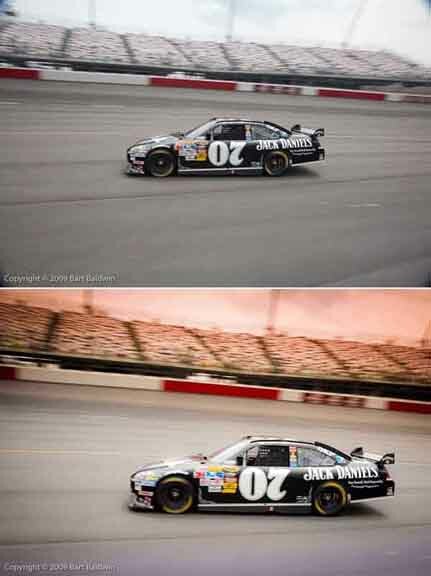 The great Nascar images above by DPA instructor Bart Baldwin, based in Charlotte, NC are stunning images of great popularity that generate vast interest that could easily be marketed to race fans, automotive companies, auto shops, magazines and calendar printers. With a little help from post production software as seen in the before and after images provided by Bart the dynamic feel of being at the track, in the pits really comes forth. People who love race cars want to get this close to the cars, if fans can’t get a pit pass it’s up to the photographer to get them closer. There are a number of sites that cater to photographers and illustrators, or fine artists that provide a forum or outlet for independent artists to sell their work as reproductions on-line. I am a member of Fine Art America but I don’t sell prints through them. I joined up to promote some events, galley shows and a Tribeca Arts Festival I was exhibiting in. I don’t think its a bad idea for making money. It may be a bad idea for being taken seriously as an artist in some circles, primarily the art gallery market. If your prints or drawing were available on one of these site it could undermine your credibility in the Art Gallery market. But if you′re not really in that market (IE with gallery representation) maybe it doesn′t matter. And in some cases photographers have been “discovered” on Flickr and similar sites. Who knows, the mass market and greeting card thing worked for William Wegman. He started out as an fine art photographer in the 1970s, now he’s a very successful photographer primarily thought good marketing and vast merchandising (cards calendars etc). If you don’t recognize the name William Wegman, you will surely recognize his ubiquitous images of lanky, svelte weimaraner hound dogs in comical very-people-like poses and situations. As with any venture, where people are licensing your images I would caution you check the fine print with regard to copyright and reproduction rights etc. Make sure you as the photographer own and retain the copyright and reproduction rights. Just as important in the event you cancel your membership, confirm the site or organization can NOT continue to sell your images, or continue to use your images to promote their site etc. Make sure people can NOT download large res files without payment because nefarious or perhaps uninformed web surfers will just go ahead and print the images for themselves, or use them in ads, websites etc. It’s a good idea to watermark your images if possible to prevent this. I don’t watermark the photos on my site, www.johnbentham.com and I’ve only encountered a few minor web usage infractions over the years, which is not to say more haven’t occurred. I’m just blissfully ignorant of them. Many people are not aware they need to pay, or even ask permission to re-post your photos once an image appears on the web, many people assume if something is online it resides in public domain. A wonderfully nostalgic and striking photo above of a classic 1960 Cadillac Crown Royal hearse, shot on location as part of a DPA advanced workshop by New Jersey DPA instructor Rick Gerrity is also a shot that could appeal to the auto and car collector market, the outlets for which are innumerable. Rick has captured a distinctly unique angle of a unique vehicle, essentially nailing the trick to a lot of good photography. With a little touch up in Photoshop and some dynamic and intense effects added using NIK Viveza 2 software the shot leaps off the screen … or greeting card, or calendar, or poster, or web site … well you get the idea. Photo Hosting and Print Sales Web Sites: These are primarily for photography but if you are an artist or illustrator you could just as easily upload digital files of drawings. You post your photos online, people buy prints online, the site prints and sends the prints (fulfillment), you receive a percentage of the money. Some of these sites have a monthly fee, some are free. Flickr also has a deal going with Getty Images, one of the largest photo syndication agencies, that allows Getty to approach Flickr photographers for independent licensing of images for stock sales brokered by Getty.